How do we communicate with others, when we don’t speak the same language? How do you ask for help or understand others? You may find that you turn to your hands- and express yourself using gestures or simple signs, maybe with some wonderfully exaggerated facial expressions and possibly a few good sound effects thrown in too! It’s the same with babies. How do we work out what they want before they can talk? The answer is baby signing, natural gesture and new classes have just been launched in Durham Tees Valley. Babies can use their hands to wave, clap and point at objects from around 6 months and through these new classes, parents and babies can learn a whole range of signs to discover what their baby wants to say! When a baby then looks at or points at an object, we can tell them what it is and also show them the sign for it too. For example ‘drink’ is the iconic gesture of putting a cup up to our mouths and when we teach our babies these signs, we also show them, with their hands, exactly what to do. It doesn’t take them long to do it themselves and telling you that they’d like a drink when you didn’t actually realise that they were thirsty. Although signing is fun to do with your baby, it’s also easy to forget that it’s so worthwhile. You’re enabling your baby to communicate their interests, needs and thoughts long before they can speak. Why let them wait until their words can be formed? Babies have so much that they want to say before they can actually talk. Using signs you’ll be empowering your baby and creates a really special bond between parent and child. 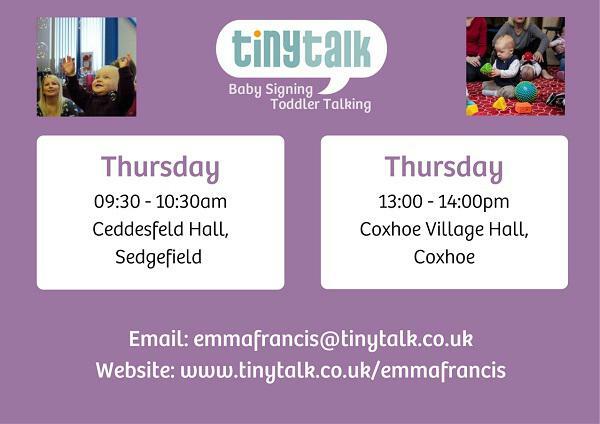 Multi award-winning TinyTalk, the first baby signing organisation to deliver baby signing classes across the UK, is now in its 15th year, helping young families understand each other better and delivering classes to over 7000 families a week, now with over 120 teachers. With their much-loved mix of lively nursery rhymes, multi-sensory toys, instruments, books and playtime, plus with a special focus on easy-to-learn signs and the importance of understanding each other, it’s a lesson not to be missed! After the session, we have a social time where we have hot drinks and biscuits for our hard working families. It is a chance to chat to other new mums and make long lasting friendships, for you and your babies! It’s never too early to start understanding each other. Classes are starting in Durham Tees Valley on Thursday 25th January 2018. They are suitable from birth to 2 years and run on Thursday mornings 09.30-10.20 at Ceddesfeld Hall, Sedgefield and on Thursday afternoons 13.00-14.00 at Coxhoe Village Hall, Coxhoe.